So, everyone knows it's hard to get together with your friends and spend some quality time catching up, right? Well, some girlfriends of mine from high school decided to remedy that last year, when we went on the first girls getaway. We packed up and headed to Kalispell, Montana for the weekend and visited, shopped, perused the town, and relaxed leaving our husbands, kids, jobs, school, and stresses behind. Well, it was so fun, we've decided to make it an annual excursion. This year, we went to Great Falls. A little bigger, more stores (yikes), more nightlife, and just as much fun! We piled into Sam's truck (actually, it's Sam's husband's businesses truck... remember that letter of permission from your husband next year, Sam.... crazy American border guy) and headed for the border. 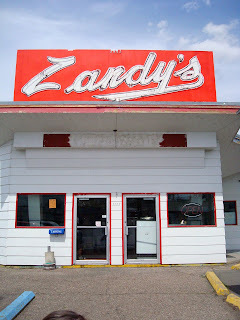 Zandy's, a great little Peters-esque drive through. V. good fries and shakes, and it was like $3 for each of us. 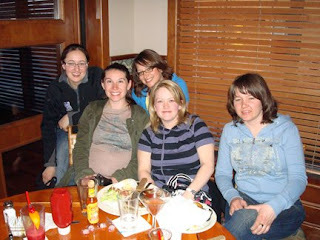 The whole group, in our favourite resaurant in Great Falls, Jaker's. Crazy Americans... we thought this sign was too funny, and we just happened to have a pregnant lady along, so we threw her in the photo for good measure. Come on guys, why wouldn't you leave your kids here? Just like a coat check, your kid will be shoved in a closet and if you lose your ticket, you'll have to leave them overnight. The truck loaded up on the way home. Yep, we resorted to tubs to store everything. Excellent trip ladies! Can't wait for next year!